Abbie Jackson has done more for Charles Wright Academy volleyball during her career than what shows up on a stat sheet. In four seasons, the 6-foot-1 senior outside hitter — who will become the first Division I volleyball player the school has produced when she signs with the University of Houston later this fall — has helped draw interest to the program. Tarriers coach Mindy McGrath, now in her 16th season at Charles Wright, says a player like Jackson — who plays six rotations and has 60 kills, 16 aces and six blocks in 10 sets so far this season — is all a small school needs to build a program. Jackson plays club ball with Puget Sound Volleyball Academy, and was the only Class 1A player on her team last season, with the rest of the roster attending 4A and 3A high schools. Because Jackson didn’t transfer, McGrath says there is a bigger group of girls at Charles Wright excited about volleyball after seeing Jackson’s success. And, beyond helping build the program through her play on the court, Jackson has done even more off of it. 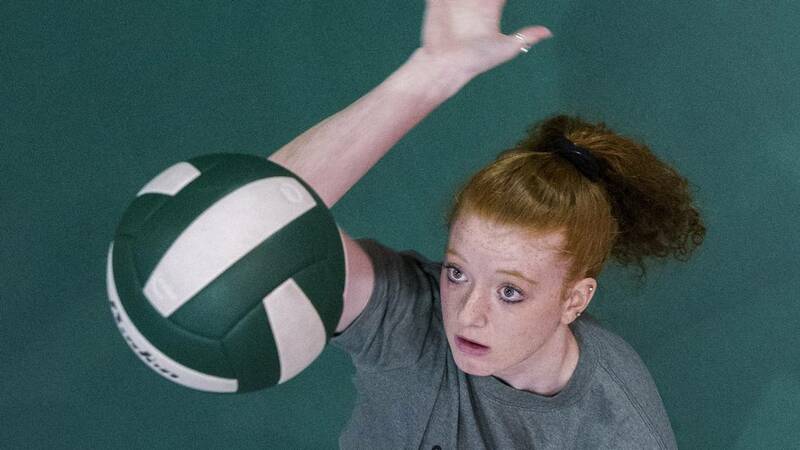 Each of her high school seasons, she has organized a fundraiser called “Dig for the Cure,” to raise awareness for hydrocephalus, which causes an excess build-up of fluid that puts pressure on the brain. The fundraiser is held each year in honor of McGrath’s 9-year-old daughter Gracia, who is a student at University Place Primary. “My freshman year I wanted to do a fundraiser, and my coach has a daughter with hydrocephalus,” Jackson said. “I’ve been organizing it for the past four years. We have a game dedicated to Gracia. I sell shirts and bracelets throughout the school community, and we’ve raised (more than) $10,000 the past three years. All of the proceeds from the fundraiser go towards research for finding a cure. Jackson’s freshman season, she raised about $3,000. Her sophomore season, about $4,000. Last season as a junior, about $5,000. “We’re hoping to exceed that this year,” she said. This year’s “Dig for the Cure” match is set for 5:45 p.m. Friday when the Tarriers host Vashon Island. McGrath said the annual fundraiser has meant a lot to her family, and especially Gracia, who has had “a grin ear to ear” each year she has attended the match. “I love Gracia, and I’m really close with my coach, so we have a really good relationship,” Jackson said. Jackson said she plans to study occupational therapy at Houston, and wants to work with special needs children. She first visited the campus with her mom two years ago, and met with an adviser in the health sciences department to discuss her academic future in addition to meeting with the volleyball program. “I went down there and fell in love with it,” Jackson said. She committed to Houston the summer after her sophomore season, choosing the school over other Division I programs like Pepperdine and Portland State. Joining the Cougars will be a homecoming of sorts for Jackson, who was born in Dallas, and moved to Washington with her family as a fifth-grader. At Houston, she will join a roster that is mostly comprised of Texans, and is off to a 13-6 start this season. “I’m just really excited to go to Houston and be challenged by the atmosphere, the players, the coaches, everything, and to get into the academics that I want to study,” Jackson said. With Jackson on the court, the Tarriers have advanced to the state playoffs each of the past three seasons, including a school-best sixth-place finish her freshman season. Her junior year, Charles Wright won both the 1A Nisqually League and 1A West Central District titles for the first time, and Jackson thinks the Tarriers are set for another productive season. Jackson’s leadership and presence on the court will be a key. She was a TNT All-Area and Washington State Volleyball Coaches Association second-team all-state pick last season.